"Kids's are like Blind Passengers--They just don't see what's coming down the road- Leonard Peacock"
This is a book that I needed some time to think about before writing a review. I finished this book in one sitting. Not because it was a light read; Not because it was an easy read; But because I felt so deeply sorry for Leonard and started to care for him so quickly that I just couldn't put the book down before learning what his fate would be. The writing of this book was superb. Matthew Quick penned such a heart-breakingly beautiful character. Yes, it is dark and it has moments that make you cringe. But behind Leonard's loneliness was a beautiful person. Someone that I would love to know. He was such a kind soul deep down, and Quick did a phenomenal job at letting that shine. The breaks between the gray skies and depression were definitely savoured during my reading experience! There are moments early on, and throughout the novel where you can sense Leonard hanging on to a shred of hope. Where he is almost willing to ditch his plan if someone does that one thing. Just a simple phrase or moment. If they do it, he will stop what he is going to do. You learn from just these few moments that Leonard just wants to sit and talk, someone to just listen to him. Not only did the author create a beautiful character within Leonard, he also passed that along into 2 other characters that I loved very much. Walt and Herr Silverman. Any moment that they entered the scene, I sat up a little taller and fell into the book a little deeper. What wise men they were! I never expected coming out of this novel learning so much. Matthew Quick definitely taught me more than I could have imagined coming from a novel. 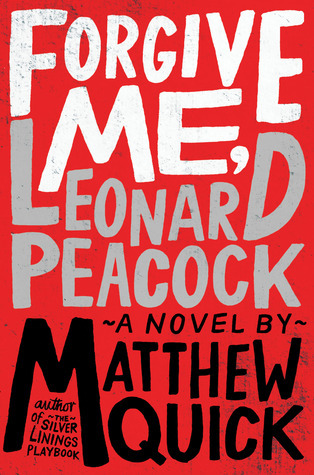 Although this storyline is a tough one, Forgive Me, Leonard Peacock is truly a character driven novel. If any character lacked even the slightest than the novel wouldn't have had the same impact on me. This day in age when Bullying and Suicide is on the front page news far to often, Matthew Quick gives a glimpse of hope. And the assignment given by Herr Silverman should be one definitely practiced! 'Letter from the Future'...Genius! This is not a book I'd normally read, but I'm really loving the sound. Character driven novels can be great and I think Leonard will touch me. I definitely hope to read this one :) Great review.